Your vegetative waste will be collected once per week on your garbage collection day. • Place all items shall be placed adjacent to but not in the street by 6:30 am on the scheduled pickup day to ensure pick-up. • Bulk waste and yard waste materials must be generated by the resident at the residential unit where the bulk is collected. 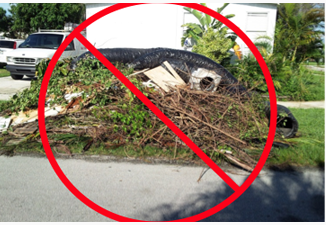 • Vegetative yard trash MUST be put in disposable containers not to exceed 50 lbs. and 4 feet in length or tied in bundles also less than 50 lbs. and 4 feet in length per bundle. If you experience a “missed pickup” on your collection, or have any questions please call the Waste Pro customer service at (843) 645-4100 or resident can simply report a problem via Trac-Ez. 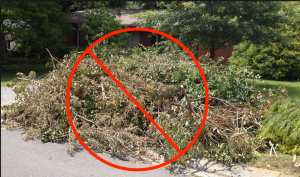 If your yard waste is not in compliance with the City ordinance it will not be picked up. The Waste Pro driver will prepare a tag that will inform you on the specific reason(s) for the rejection. He will place the tag on your front door.